The Globe is forming a new street band led by the energetic multi-instrumentalist Stuart Finden. The band will rehearse once a fortnight on Saturday mornings from 10am to 1pm at The Globe, Railway Street, Newcastle NE4 7AD. 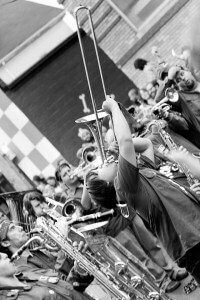 When they are ready the street band will perform at various events and festivals and at The Globe, of course. We need wind and brass players to join the band now, and there will be opportunities for drummers a few weeks later. We are looking for enthusiastic musicians. You need to be competent but you don’t need to be expert. You will learn the arrangements ear so you won’t need to read music. The main point is to have fun. The first session is likely to be on 6 May. There will be a charge of £3 per person per session.